A recent research conducted in south-eastern districts of Nepal suggests that Rajbanshi mothers those who suffer from abortion or still birth or have lost a baby called pithiya and chhatka are the victims of a stigma of social discrimination. The traditional practice of cutting of umbilical cord and shaving off the head by barbers are unsafe and more likely to cause infection in newborns. The author Nawa Raj Subba carried out the qualitative research in southeastern districts of Nepal with the approval of Tribhuvan University, Institute of Humanities and Social Science, Research Committee, Kathmandu Nepal in 2013. The aim of the study was to explore traditional maternal and child health care and to uncover harmful practices. Methods employed in - depth interviews and FGDs with traditional birth attendants, traditional healers, female community health volunteers, health workers and mothers. The study included 60 samples from Morang, Jhapa, and Sunsari districts. Tools were semi - structured questionnaire and checklists. Figure 1. Development of traditional practices. 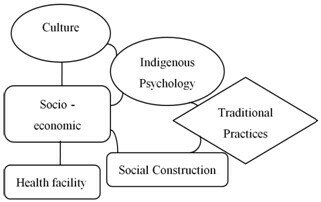 The study described the native knowledge or an indigenous psychology on health care practices is interdependent with the socio - economic condition and available health services in the community. Rajbanshi mothers perceived things with their existing knowledge that is externalization of practices. The community institutionalized the traditional practices through the objectivation. Study said that during the course of internalization of maternal and child health care practices there were various external factors interacted with the particular ideas, feeling, and experience to continue or transform their traditional practices. Rajbanshi communities have native culture of mother and child health care. Guru Gosai, Gosai, Ojha, and Dhami are traditional healers in the community. Guru Gosai plays a vital role to conduct birth, marriage and death rituals. They believe that traditional causes of diseases are deities, witchcrafts, evil spirits, a touch of pithiya/chhatka, and poor sanitation. Traditional healers find the cause through a jokhana. They treat patients by chanting a mantra, jharphuk, jadibuti, buti, and ferani. TBAs and health workers conduct home delivery however trend of hospital delivery increased. The study figured out a mark of a stigma where women pithiya or chhatka are suspected as cause of disease and illness in others. Community people perceive them unholy and unfriendly. Thus, pithiya and chhatka women face unfair treatment. They are vulnerable to maternal and child health. On the other, the traditional practice of cutting the umbilical cord by a barber during a delivery and shaving off newborn's head after a delivery by the barber are harmful practices.